Detox products: Opiate (HER,MOR) Cassette Drug Urine Test. Pass drug tests, passing all drug test. 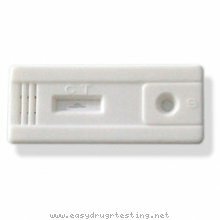 Opiate (HER,MOR) Cassette Drug Urine Test is a simple one step immunochromatographic assay for the rapid, qualitative detection of opiates and their metabolites such as codeine and heroin in urine. The cutoff of the test is 300 ng/ml of OPI. It is the same as the SAMHSA recommended assay cutoff. Note: The opiate morphine heroin test provides only preliminary data, which should be confirmed by other methods such as gas chromatography/mass spectrometry (GC/MS). Clinical considerations and professional judgment should be applied to any drug of abuse test result, particularly when preliminary positive results are indicated.